Slazenger is a stunning, quality brand from the UK! It's the largest sponsor of Wimbledon, and if you choose this awesome golf shirt to be a part of your corporate uniform, you can join the ranks of champions who proudly wear the Slazenger brand. Brand Innovation is a premier supplier of this great golf shirt brand in South Africa. Slazenger South Africa – If you’re looking for awesome Slazenger Golf Shirts, then why not choose the Crest? It is one of our most popular golf shirts, and we have a large stock holding. Brand Innovation is a premier supplier of Slazenger Apparel in South Africa. To get your amazing, branded golf shirts, send us an enquiry today. We distribute all across the country. There are so many reasons to buy Slazenger Golf Shirts that we’re going to have to break this down into bullet points to fit them all in. Slazenger is one of the oldest sporting brands still in operation in the world. At 136 years old, this brand has over a century of construction experience, and it shows. These golf shirts are awesome quality. Fresh, sporty designs are perfect for young athletes, and for sports teams. And it makes this an incredibly popular brand. People recognise Slazenger as being a top brand, and it has an affiliation with tennis, hockey and golf. More than that, Slazenger is one of the biggest sponsors of The Championships, Wimbledon. And they have the world’s longest sports sponsorship thanks to that. Slazenger has been keeping The Championships in tennis balls since 1902. So why choose Slazenger? Why choose the Crest Golf Shirt? You get great quality and a brand that has been used by sporting championships for over a century. And with a superb selection of colours, it is sure to flatter any brand. Speaking of brands, how is your looking today? 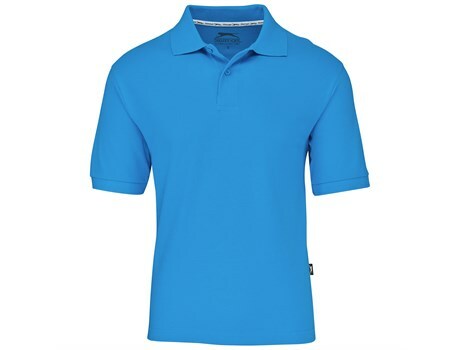 Have you made a crisp Slazenger golf shirt a part of your corporate uniform yet? Brand Innovation is a premier supplier of Slazenger Golf Shirts Wholesale. That’s right, you can order these beautiful golf shirts in bulk. This makes it the perfect way to keep you brand looking sharp. Buying in bulk allows you to kit out your whole staff or event while getting the best pricing for your quantity. Our minimum order quantity for these beautiful shirts is 25 units, and the more you order, the better your costing is going to look. Slazenger may be a sporting brand, but it looks just as great for the office as it does on the field. This is a brand with a long history, and a lot of experience that still keeps in touch with fresh, modern designs. It’s one of our most popular golf wear brands. And with good reason. Having Slazenger as a part of your corporate uniform is a great way to align your brand with quality and action. Slazenger is for champions! It’s for the movers and shakers, the go-getters. So why not push your corporate uniform to the next level, and go get yourself some Slazenger golf shirts from Brand Innovation? We are a premier supplier of Slazenger South Africa.